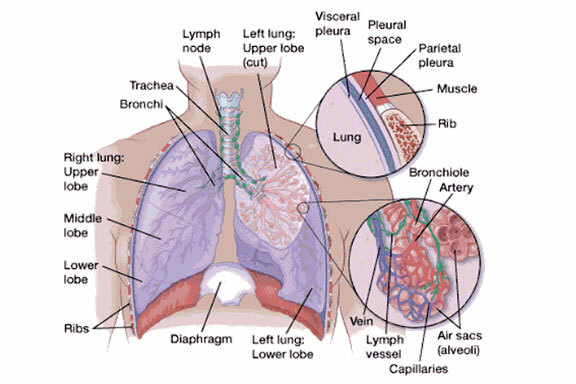 The lung is part of the respiratory system. You use your lungs when you breathe. The lungs are in the chest, one on each side of the heart. The right lung has 3 main parts, called lobes. The left lung is a bit smaller and has 2 lobes. The lungs are cushioned and protected by a thin covering called the pleura. Cells in the lung sometimes change and no longer grow or behave normally. These changes may lead to non-cancerous (benign) tumours such as hamartoma and papilloma. But in some cases, changes to lung cells can cause cancer. usually starts in glandular cells on the outer part of the lung. This type of cancer is called adenocarcinoma. Non–small cell lung cancer can also start in flat, thin cells called squamous cells. These cells line the bronchi, which are the large airways that branch off from the windpipe (trachea) into the lungs. This type of cancer is called squamous cell carcinoma of the lung. Large cell carcinoma is another type of non–small cell lung cancer, but it is less common. There are also several rare types of non–small cell lung cancer. These include sarcoma and sarcomatoid carcinoma. usually starts in cells that line the bronchi in the centre of the lungs. The main types of small cell lung cancer are small cell carcinoma and combined small cell carcinoma (mixed tumour with squamous or glandular cells).